By now it is well documented, here and perhaps everywhere, that North Dakota experienced a significant economic transition over the last ten years. How permanent and sustainable a change is the current question. At the risk of editorializing too much I will just point out, that is almost always the question, and we seldom have an answer until well after the fact. This issue aside, I looked at the median income data by county in North Dakota. The data are the 5-year estimates from the Census Bureau. If you want all counties in the state that is the data series you need to employ, and since I want to look at counties across the state that is what I chose. 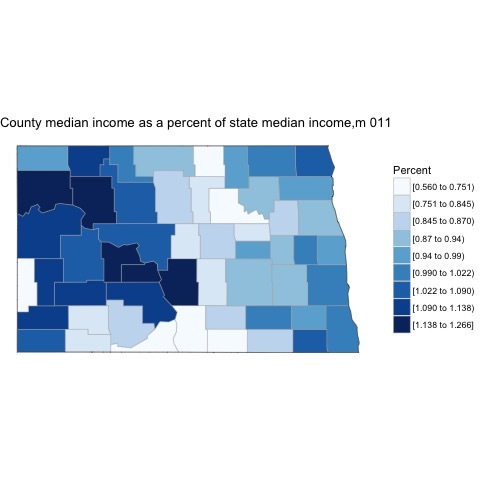 I took each county median income measure and divided it by the median income for the state as a whole to see how the individual counties changed over time. The first year was 2009. In 2009 the shale oil expansion was well underway and the data really confirms this. The large cluster of counties in the western part of the state with higher median incomes, compared to the state median income, is really pronounced. The middle of the state seems to be where the lower median income counties located, for the most part, and the eastern part of the state is somewhere in the middle of the pack in percentage terms. By 2011 it is pretty clear median income levels are highest in the west, and that the west is leading the way in median income growth. The cause is no mystery, the shale oil boom created an enormous opportunity in oil, in activities servicing the oil industry, and those closely related. Add to this the increases in consumer demand that occurred due to higher compensation packages and the concentration of high incomes in the west is quite significant. The west at this point becomes somewhat boring. It remains a cluster of higher median incomes and while there are some changes in the counties in the highest category I am shifting my attention to the east. 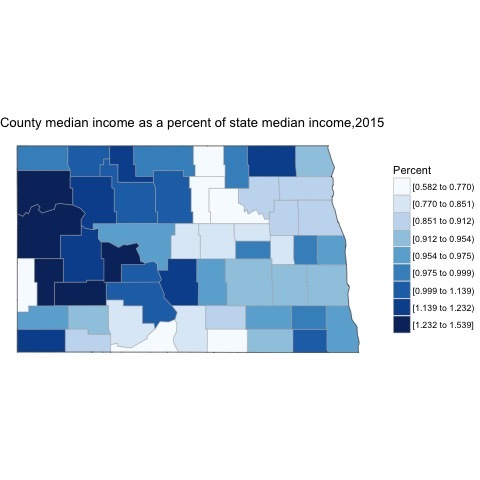 Notice that Grand Forks and Cass counties are not in the highest categories, in fact they are fairly average as far as the median income ratio goes. It is interesting because these are two of the more diversified economies in the state, and they are not performing as well as the region with the one sector enjoying an enormous boom. This is in fact a non-trivial point when it comes to economic development policy at the local level. There are difficulties when it comes to diversifying the economy, but at times it is made more difficult because it may mean sacrificing economic growth as you move focus away from a sector that may boom. Clearly the supposed virtue of diversification, offsetting the downside at the cost of some upside, would be argued to offset the costs. 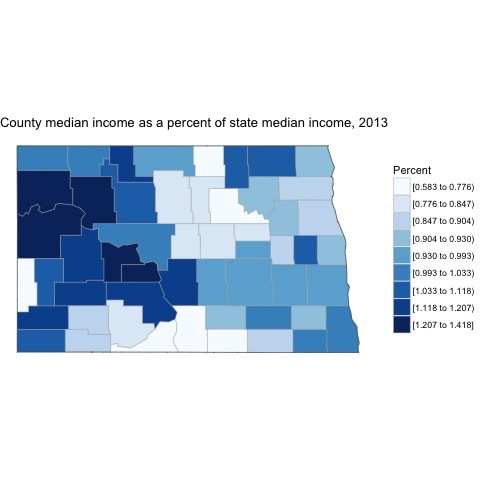 Once again the eastern part of the state stays mostly in a middling situation with few counties at either extreme though it is interesting to go back and look at the maps and see that the corridor between Bismarck and Fargo changed such that all counties moved into the middle and upper levels of the median income ratio. There are as yet no signs of the oil collapse in this map, interest given the errors in revenue forecasting that occurred. The East remains the significant area of variability in this regard again. In this circumstance there are a few counties in the shale oil region that drop down in terms of category and the East sees some changes as well though again it remains mostly around the median level. Should it be a surprise that the East is at the median level. Not entirely. 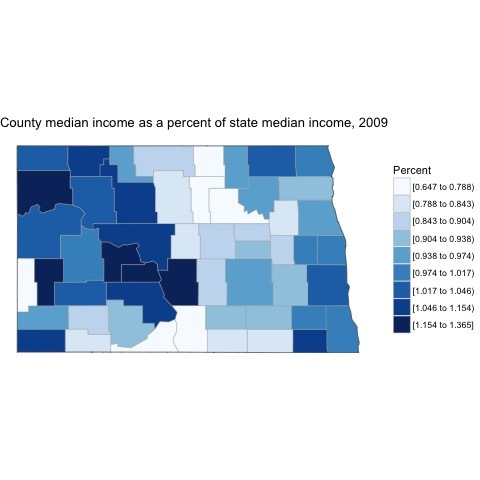 Even during the height of the Bakken oil boom the population concentration was still in the East, particularly Fargo, and so as a result the household median income for Cass county would have a large weight in the state number. Williams county, as an example, saw significant increases in population and labor force, in some periods eclipsing the total increase in the state, but Williams never threaten to overtake Cass in terms of population or households. That same population issue may keep Williams and other shale producers in the higher value categories, but the stability of their presence in that end of the median income ratio when compared to the state is really quite surprising and impressive and speaks to the economic expansion enjoyed in that region over the last decade.